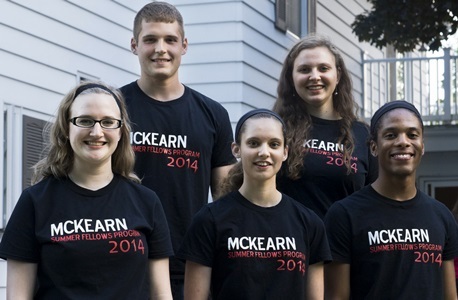 The 2014 McKearn Fellows: (left to right) – Lexie Williams, Zachary Howard, Shekinah Bergmann, Rachel Lapidus and Kenneth Barnett. Lazy days of summer? Think again. For nearly 30 undergraduate students on campus at NIU this summer, the season provided opportunities to work alongside professors and delve deep into research projects. It has six legs and can move perfectly parallel to the ground while stepping over obstacles, making it an ideal vehicle for such uses as landmine detection, gathering of remote video or the transport of hazardous liquids. 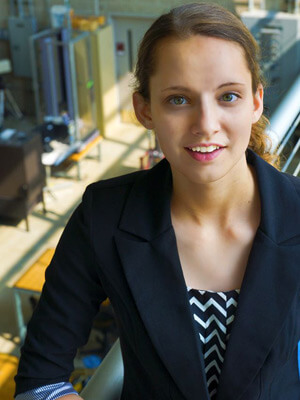 “It is so amazing to imagine something that does not exist, model it on the computer, and then bring it to life,” says the 19-year-old sophomore from Sycamore, who’s simultaneously pursuing law and engineering degrees. She hopes to become a patent attorney in the future. Bergmann was among the student summer researchers who gave presentations and displayed posters on their work during the Summer Research Symposium held today at Altgeld Hall. Most of the students had participated in one of three specially focused programs designed to nurture their interests in science and artistry: Research Experience for Undergraduates (REU), McKearn Summer Research Fellows and the Summer Research Opportunities Program. Each program is eight weeks in duration and provides room and board on campus along with significant participant stipends. 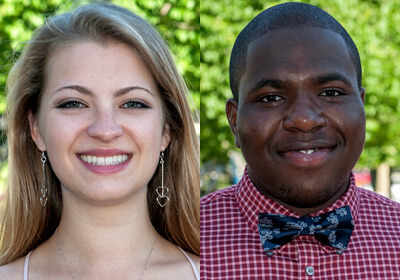 Other students took part in the Undergraduate Research Assistantship program, the Summer Internships in Science and Technology at Fermi National Accelerator Laboratory, the University Honors Scholars Program and National Science Foundation grant-funded research within the Horn Lab on campus. Regardless of the program, all of the students worked with NIU faculty on research relating to topics important to society, such as obesity, cancer therapy, prairie restoration, marine biology, water quality and energy storage. Bergmann, one of five McKearn Fellows this summer, found the research exciting, but she also learned about trial and error. “This experience has shown me what the invention process is like, as well as how to handle multiple failures along the way. No inventor ever got it right on the first try. That is why this experience has been so great, because I was given room to fail, yet the tools to move on and succeed,” she said. Anthony Roberts of Chicago, a junior working toward a degree in biomedical engineering, was equally passionate about the value of his experience. 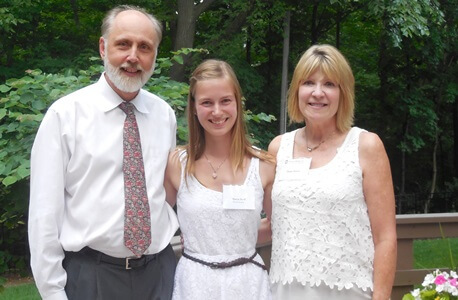 As a member of the Summer Research Opportunities Program, Roberts worked alongside Electrical Engineering Professor Martin Kocanda, studying ways to rapidly identify bacteria using their distinct electrical responses. Maria Senf, a 24-year-old senior psychology major from Potsdam, Germany, wanted to deepen her scientific knowledge. She worked with professor Alecia Santuzzi on a project investigating how workers interpret supervisors’ behavior when being evaluated. Maria Senf with NIU President Doug Baker and First Lady Dana Stover. Senior Ashley Rose Pales of Oswego, who is double majoring in geology and environmental studies, also wanted to get some research experience before applying to graduate school. She found the REU program offered topics she was interested in. After applying and be accepted to the program, she worked with biological sciences professor Neil Blackstone investigating coral bleaching, a process that degrades or destroys healthy coral. Pales is thrilled to have worked on a project that could make a difference in the future. The issue “is important for future implications dealing with coral bleaching, climate change and potential oceanic changes,” Pales said. “As global climate change occurs, mass bleaching events are becoming more common, and coral bleaching is becoming a critical ecological and economic issue. That’s a sign of success, according to Julia Spears, associate vice provost for Engaged Learning. 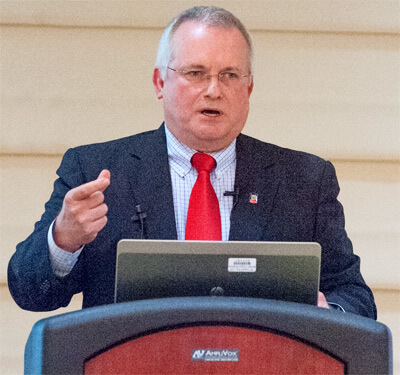 “Participation in our intensive summer research programs challenges students to think big by doing a deep dive to answer a specific research question,” Spears said.